Whether you live in a single-family dwelling or you’re in a town-home complex, the Char-Griller Pro 40,8000-BTU is a perfect addition to your backyard festivities. This three-burner grill offers a smaller gas unit that allows you to cook your favorite foods right outside your door. This amazing grill provides a large surface to grill your favorite meats or veggies and also a side burner if you need to have a little more room. There’s plenty of storage room and prepping room on the grill to give you ample space for your BBQ Cooking. Whether you’re having a larger gathering or just the two of you, you can enjoy tasty grilled dishes every day if you wish. There’s a total of 630-square-inches of cooking space provided on this propane gas grill. You can cook on the main surface which is 438-sq. inches, or add the side burner which offers another 192-in. of warming area. You can prepare your grilled veggies, meats, and other items all at the same time with an ample space to cook on. When you want to grill, sometimes you want it to be fast and simple. A charcoal grill can take up to a half an hour or more to get the grill ready to cook before you start cooking anything. With this Char-Griller Pro unit, you have an easy ignite system that allows you to grill in much less time. With the simple push of a button, your ignition system is on and you’re ready to start preparing your food. The grates are porcelain coated and made of cast iron so they are quite durable and easy to maintain. You can cook on these grates for a long time to come as long as you clean them each time and keep them protected from the elements. When you’re in the market for a new grill, a great resource to check out the real-life talk of these grills is the customer reviews. On Amazon with over 750 reviews listed, the Char-Griller Pro received a 4.1 out of 5 stars rating earning it an Amazon’s Choice Grill. Overall the majority of people who purchased the Char-Griller Pro seem to really enjoy using it. However, there are some remarks you need to take into account when purchasing this particular model. As far as the concerns that were prevalent, one of those was the rusting of the components. Some people said they had a real problem with parts of the grill rusting before what they felt it should have. Others had issues with shipping and receiving damaged grill parts that needed replacing. 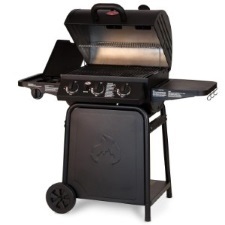 As for those who love the grill and highly recommend it, this is what they had to say … “No better grill under $200” … “I’d buy it if I was you” … “Great medium-sized grill” … “Pretty easy to set up” … “Still going after 3.5 years”. Overall this is a fantastic grill to add to your backyard cooking arsenal. The Char-Griller Pro 40,800- BTU unit offers three powerful grilling units plus the side burner to cover all your grilling needs. You can cook for a party of 20 or more or for a part of 2 all at the same time. This grill offers a great affordable price, easy to use machine, set up is a breeze, and it is all covered with a warranty from the manufacturer for the first year you own the grill. If you’re looking to buy a propane powered grill that offers ease of use and maintenance, this is the one you’re after. It is a sturdy design with a variety of options to make it the perfect grill for family BBQ’s, tailgating at your home for your favorite game, or simply cooking a healthy and delicious weeknight meal for your friends.